Ever since the internet has existed, the dire need for security and browsing privacy has been a debatable issue. As hackers continue to deploy spyware into the World Wide Web, the last line of defense we can employ is a VPN. While the concept of browsing with complete privacy and anonymity with the help of a Virtual Private Network is a common practice these days, the sheer number of options can make your head spin. In this jungle of VPN services, rises Private Internet Access (PIA) with the claim to be committed to keeping your data private. Check out our review below, and if PIA sounds good to you, then you should enter our giveaway for a chance to try it for free – more details at the end of the post. With a subscription to PIA, you get access to more than 3200 servers in 25 countries spanning across the globe, including several European countries, USA, India, Russia, Canada, Japan, and many others. Connecting to a USA Netflix account from India using Private Internet Access VPN was a breeze, with almost no inconsistency even with average internet speeds. Keeping your IP address anonymous, protection against malware, and blocking ads is what you expect from every VPN, and Private Internet Access does it effortlessly. Taking the security factor one step further, PIA offers IPv6 leak protection and DNS leak protection. 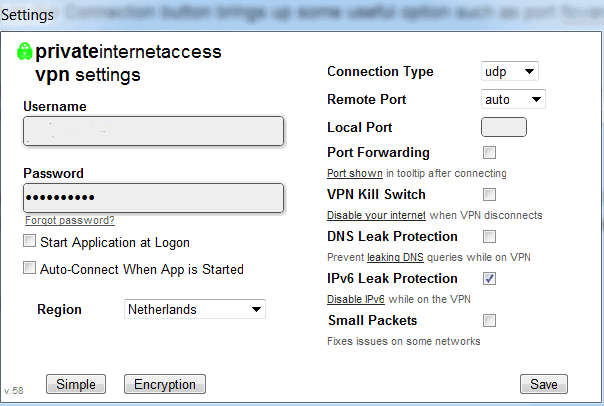 The service comes with a built-in trigger to disable your internet connection when the VPN server is disconnected. For advanced users, Private Internet Access offers PPTP, OpenVPN, and L2TP/IPSec protocols, along with port forwarding to create your own private DNS servers. Signing up for the VPN service takes not more than just a few clicks, and thanks to more than a dozen modes of payment. The Windows client used in the review is available once you’ve signed up, and comes with a pretty barebone user interface, which is ideal for newbies. For the tech savvy users, the Advanced tab brings about data encryption and authentication options, and the region can also be selected right from the log-in screen. 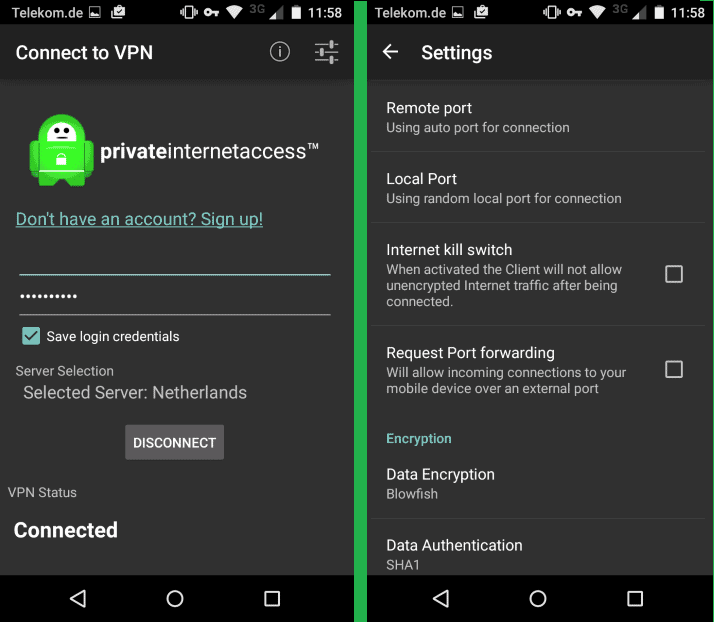 Private Internet Access Android App comes also comes a similar minimalist user interface and comes with all the encryption options that the computer version boasts. Signing in easy and takes just a minute for you to connect to any of the regions you select. Cheaper VPN services are known to siphon out your internet speed in favor of high encryption standards but this does not seem to be the case with PIA. Even on an average 5Mbps, there was only a hairline difference between the internet speed with the VPN connected. Surfing YouTube on 1080P while being connected to the UK server buffered just once, which you can with. 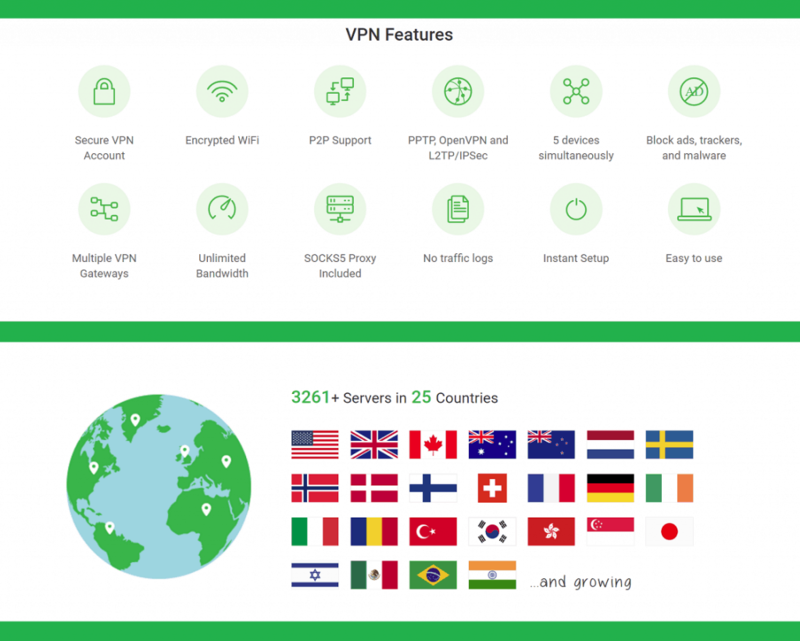 While some VPN services smartly rope in its users by providing some free trial period offers, PIA goes straight to business with monthly, 6 months, and yearly plans. The monthly plan starts off at $6.95, but you can save big with the 6-month plan at $35.95, and yearly plan at just $39.95 (52% savings). While there are cheaper VPN services out there, Private Internet Access is second to none when it comes to giving the utmost security features. However, if you are still skeptical about putting your hard earned money into it, you can always avail the 7-day money back guarantee that the service offers. 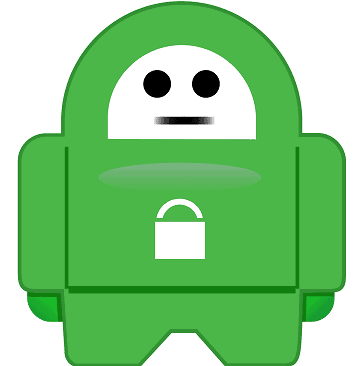 In a VPN market that is massively crowded by services of all shapes and sizes, Private Internet Access VPN forms a path to follow. Standing out of the crowd for its simplicity while harboring plenty of complex security protocols, PIA is one of the safest, and definitely one of the easiest VPN services to get around. If PIA sounds like the VPN for you, then you’re in luck. We’ve got ten promo codes that come with a month’s trial for Private Internet Access. To get a chance to win them, comment on this post and let us know what you think of VPNs and why you’d like to try one. We’ll draw ten winners from the participants and contact you for the promo codes. Get Private Internet Access Now! Edit: since we got 8 comments on this post, everyone won! We’ve contacted you to claim your prize.